This month's challenge for the Daring Bakers was just perfect to cool off the heat this past week. 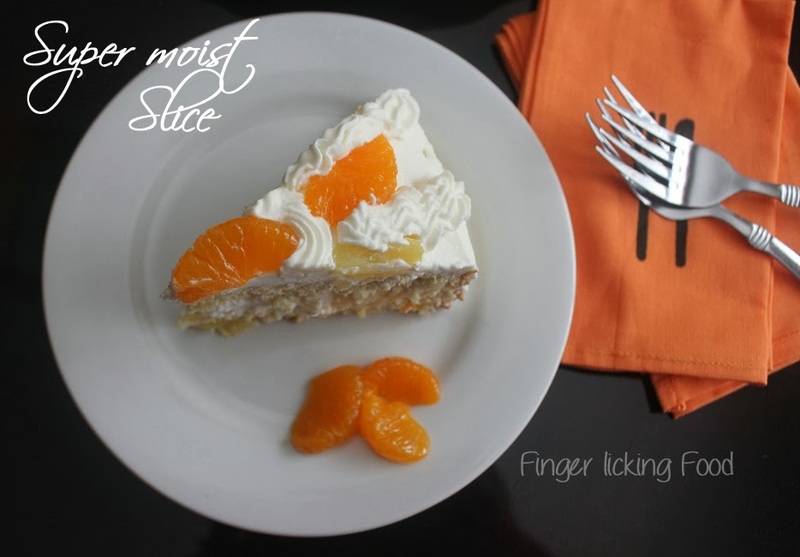 A chilled super moist cake soaked in a mixture of sweetness layered with fruit and whipped cream...mmm..! Sound familiar? "Inma of la Galletika was our Sept. 2013 Daring Bakers’ hostess and WOW did she bring us something decadent and delicious! 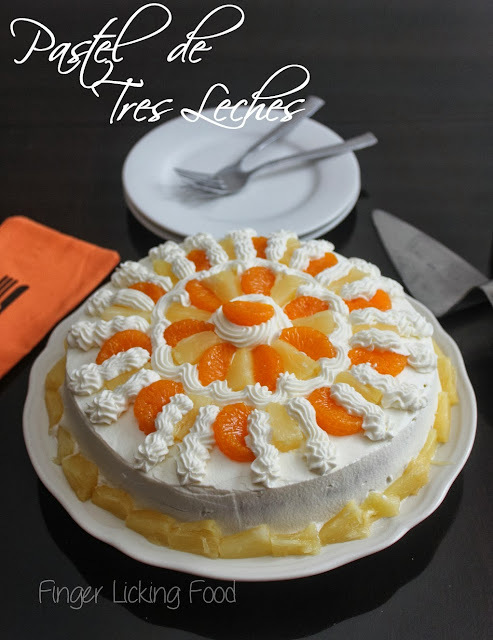 Pastel de Tres Leches or Three Milk Cake, creamy yet airy, super moist but not soggy.. just plain delish!" I've made Tres Leches before so this wasn't so much of a challenge for me. What was different however, was the fact that this was a free-standing layered Tres Leches as opposed to the Tres Leches I've always made which is a cake soaked in a pan. I never had to worry about how well the cake was soaked or if it would make a huge mess by oozing out the excess milk mixture. So this, I really wanted to try. Recipe Source: This recipe is slightly adapted from an interview given by one of Mexico's best Pastry Chefs; Paulina Abascal to the magazine Revista Secretos de la Pastelería Caserais. It produces a super moist, yet light Tres Leches. Mandatory Items: You have to make 1 three milks cake. I was waiting all month for a reason to make the Tres Leches.I didn't want to land up eating all of it myself :) I'm taking this to dinner to a friend's place tonight. Preheat oven to moderate 180°C/350°F/gas mark 4. Prepare a square 9”x9” (23cmx23 cm) pan or 9” (23 cm) round cake pan by greasing with butter and dusting with flour. Beat the egg whites on medium speed, 3 - 5 minutes. When soft peaks form slowly add the sugar in small batches. Whip until stiff peaks form about 5 minutes. Set aside. In a medium bowl beat egg yolks at medium-high speed for about 5 to 6 minutes, or until the egg yolks become pale colored, creamy and puffy. Stir in vanilla. Pour the egg yolks over the egg whites, gently fold until just combined trying not to lose any volume from the mixture. Fold in the flour little by little in the form of rain. Mix until just combined (over-beating will result in a denser, flatter cake). Pour the batter into the prepared 9”x9” (23cmx23 cm) square cake pan or 9” (23 cm) round cake pan. Cool for 10 minutes in the pan and then let it cool completely on a wire rack. Once cool, split the cake in half, flip the top of the cake and place it on a base. Using a fork, poke holes on the cake to help absorb the milk syrup. In a saucepan add the sweetened condensed milk, evaporated milk, heavy cream and cinnamon stick, bring to a boil, reduce the heat and continue boiling for 5 minutes. Remove it and let it cool. Once it is cool, add the rum or any other flavoring you choose to use. I used Vanilla extract. Gradually brush all the milk soaking liquid into all sides of the cake (including the cut surfaces) until all absorbed. I brushed the cake with the milk mixture and waited 5 minutes to let it absorb, then brushed it again. This ensured the cake soaked up the liquid well. Whip the cream with the sugar until stiff peaks form. Spread 1/3 of the cream on one half of the soaked cake. Spread evenly using an offset spatula. Top with your favorite fruit. I used canned, drained pineapple chunks and mandarin oranges. Slowly transfer top half of soaked cake onto the bottom half, soak with remaining liquid if any. Use remaining cream to frost the entire cake with a spatula. 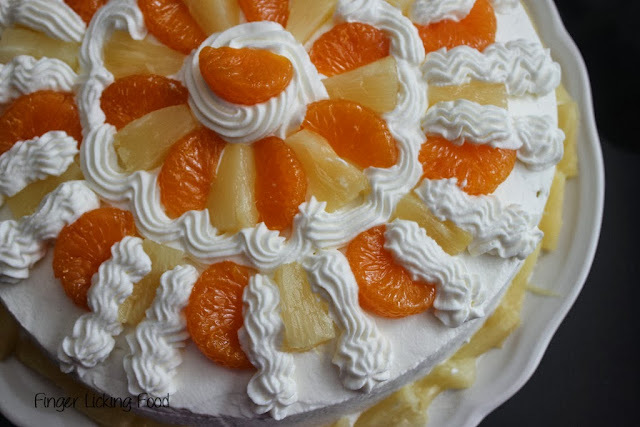 Decorate the top with more fruit. 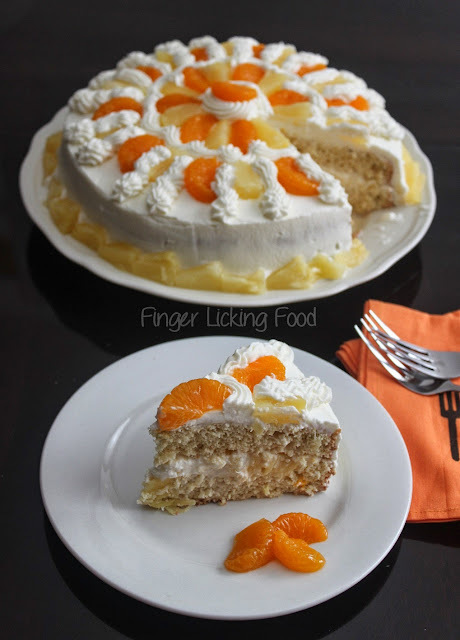 Let chill overnight which allows the cake to soak up all the liquid well and also a chilled Tres Leches tastes far better than one that isn't! Delicious fruit on a super delicious cake.. I had no trouble finishing an extra large slice! Thanks to Inma, for giving me a chance to make this crowd pleasing dessert again. Your tre leches looks delicious and the decoration is beautiful!! Gorgeous piping work and colours - it looks delicious! your tres leches cake looks fantastic and i'm sure it was just as delicious. good job on the presentation! The cake is so beautiful! Hi I am student of Bakery and Confectionary at Pusa Institute Delhi. 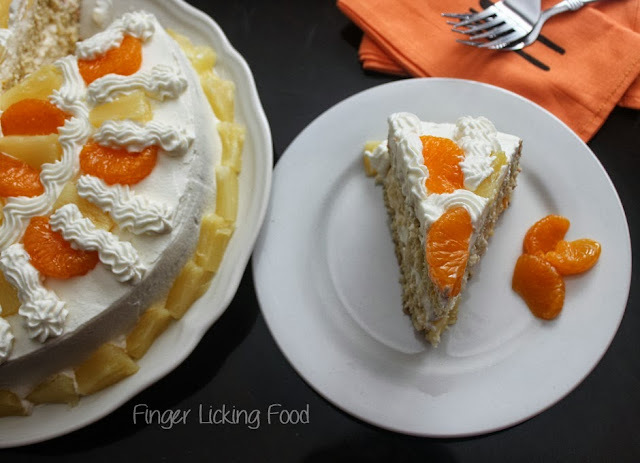 Can you please come with some cake baking tips in your next post? 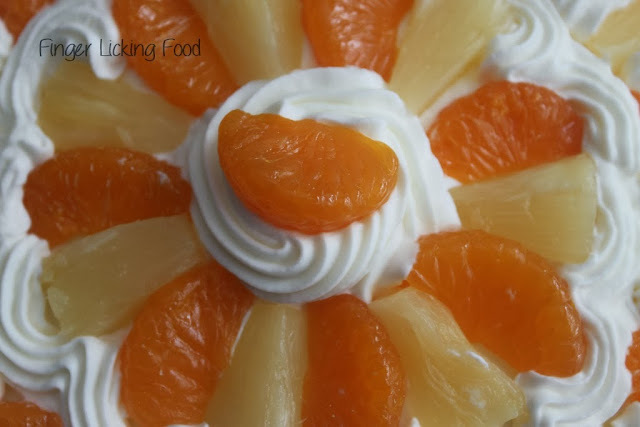 Thanks for sharing this cake recipe, I am going to use this for my baking practical. It’s really seems to be very delicious…. Very lovely cakes, thanks for hosting this food guide. I like this cute sweet cake.